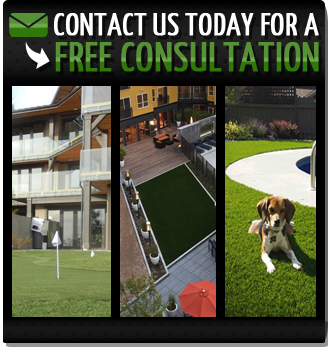 SYNLawn Vancouver proudly offers installation of artificial grass for golf courses and putting greens. Imagine having the ability to take your very favorite Vancouver putting greens home with you. SYNLawn® is making it possible with backyard and indoor golf greens that replicate your favorite natural grass greens. Our synthetic grass looks, feels and play like the real thing, making it ultra-convenient to practice your chipping and putting from the comfort of home. Our practice surfaces are available to both residential and commercial customers, as are other great options for golf lovers such as our DIY putting greens. Isn’t it time you brought the game you love to your home? Find us on FacebookThe beauty of our artificial turf greens is that as they build up your game they also add value to your home or business. Synthetic turf putting greens make a centerpiece for any outdoor space, and maintain their beauty year-round with virtually no maintenance required. SYNLawn has made the dream of having your very own practice green at home an affordable and practical proposition. We will work within your available space to create a putting green that accentuates its surroundings and fits beautifully in your home. Indulge your love of golf as never before with a custom putting green from SYNLawn. Your golf buddies will be envious!